1. When Will Slippery Conditions Occur? There are two key ingredients for the formation of slippery conditions - moisture and pavement temperatures below the freeze point of the moisture (usually 0o C). Moisture comes in the form of rain or snow, which is easily seen, and as dew. Dew will form on a surface (e.g. pavement) when the surface temperature is at the dew point. If the pavement temperature is below freezing at the same time, frost will form. Studies have shown that pavement temperatures are usually warmer than air temperatures, particularly during the day. This means that there are many times when the pavement temperatures will be above freezing even when air temperatures are well below freezing. Pavement temperatures can be measured using infrared thermometers. When snow becomes packed onto a frozen pavement surface, it will bind to the surface making it very difficult to remove. As traffic increases, this snow pack can turn to an ice pack. Salt is applied to break or to prevent the formation of the ice-to-pavement bond to allow it to be removed mechanically (i.e. plowed or shovelled off). Tracking weather conditions is also essential to knowing when to apply salt. Local weather forecasts can help to anticipate whether or not snow is likely to accumulate to the point that slippery conditions will occur. The speed that the storm is moving is an important consideration. Fast moving storms are harder for weather forecasters to predict and there is a greater potential for the forecast to be wrong with respect to timing and accumulation. Slower moving storms on the other hand are easier to predict with respect to timing and accumulations. Radar images are readily available on the Internet and can help decision-makers to better understand the timing of a storm. 2. How Does Salt Work? Salt is a freeze point depressant. This means that when salt is dissolved in water it lowers the temperature at which the resultant solution will freeze. As the concentration of salt in the solution increases the freeze point decreases. This is illustrated in the Phase Diagram shown here. For Sodium Chloride (NaCl) the temperature at which a solution of salt and water will freeze decreases as the concentration increases until the concentration reaches 23.3%. This lowest point in a Phase Diagram is known as the Eutectic Point. A sodium chloride solution at this concentration will not freeze until the temperature drops below -21o C.
As a solution is cooled, the water component of the solution begins to freeze. Since ice can hold very little salt, the salt that is present is confined to the remaining liquid phase, which becomes more concentrated. This is represented by the area below the curve and to the left of the Eutectic Point. At this point, there is a mixture of ice/snow and concentrated brine, which appears as slush on the road. As the concentration of the remaining liquid phase increases, its freezing point is lowered. The salt solution remains in equilibrium until the temperature is lowered to the point at which the solubility limit is reached and the salt precipitates out of solution. The result is a mixture of recrystallized salt, water and brine. This is represented on the Phase Diagram by the area below the curve and to the right of the Eutectic Point. There are similar phase diagrams for all freeze point depressants. As we can see from the diagram provided, a 29.8% calcium chloride solution will not freeze until the temperature reaches -51o C - this is its Eutectic Point. When we place dry salt onto a pavement surface, we want the salt to dissolve and form a solution of salt and water, which is called brine. It is this brine that in fact melts the frost, snow or ice. Our goal is to create a layer of brine at the pavement surface to prevent the snow pack or ice from bonding to the pavement. This makes it much easier to remove the snow mechanically. It can take a long time to make brine on the road by placing solid salt and letting nature make the brine - particularly at lower temperatures. It is very difficult to create a high concentration of brine in this way. This is one reason why sodium chloride is usually not used below -10o C. Two ways many public road authorities and increasingly more private contractors are addressing this problem is by spreading straight liquid salt (liquid anti-icing) or adding brine to the solid salt (pre-wetting) as it is spread to help the salt dissolve more quickly. By applying liquid rather than solid salt, it is possible to speed up the melting action. One must be careful of refreeze when working with any freeze point depressant such as salt. As more snow and ice melts, more water goes into the solution and the concentration of salt in the resultant mixture decreases. Therefore, this dilution raises the temperature at which the solution will freeze. 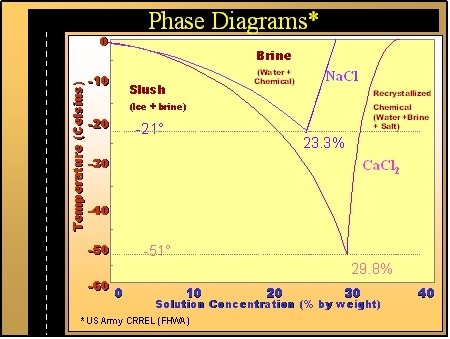 Referring back to the phase diagram for NaCl, a 15% brine solution will freeze at -10o C. If snow melts and dilutes the brine concentration by half, then the resultant 7.5% brine will freeze at around -5o C. This is one reason why it is important to remove as much snow from the pavement surface as possible before adding salt. Similarly, if the temperature drops below the freeze point of the brine, ice will form. Contractors and owners need to ensure that the people making salt use decisions understand how salt works. Moist snow will activate salt more quickly than dry snow since there is more moisture available to begin the brine-making process. Warm salt will activate more quickly than cold salt since there is more heat available to activate the brine-making process. Fine salt will activate more quickly since it has greater surface area and therefore will dissolve faster. More salt is needed at colder temperatures because it is activated more slowly. Roads that have traffic to mix the salt and snow will clear more quickly than parking lots where vehicles tend to sit for long periods of time. Property owners and contractors should determine and agree on the application rates for different conditions. The freeze point of water is lowered below 0o C by adding a freeze point depressant such as salt.